RA, the Egyptian Sun God, was inspired by what I found in my inventory of bicycle wheels and hubs: just enough of them of the same size to mount on the thick rim of a motorcycle wheel and weld together in a full circle, using the hubs as spacers. I had wanted to make a wheel sculpture for quite some time; this configuration answered my aesthetic desires. Patricia Vader is a California-based metal sculptor specializing in public art, with sculptures displayed in cities and parks nationwide. Her first public artwork, Wheely Whirly Peacock, purchased by the City of Orinda, California in 2011. It remains a public favorite and has become a landmark. 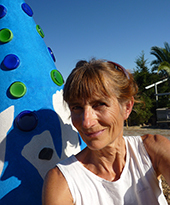 Creating site-specific, large-scale sculptures has been her focus and passion ever since. More acquisitions by American cities followed as well as commissions for public art. Vader’s sculptures have won five People’s Choice Awards and two prizes in the KAO international kinetic art competition.